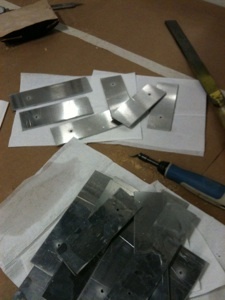 For the first time, we were using machines that could seriously maim and injure - fun! I’ve been wearing a skin conductance sensor during the day - my excitement level definitely went up the roof every time I went down to the shop. 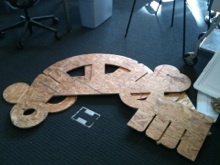 We were each given a sheet of 4’x8’ OSB plywood to cut on the shopbot. 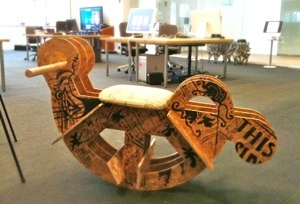 I decided to make a rocking horse that’s shaped like a treble clef. 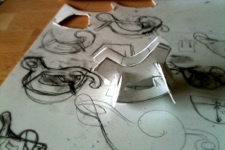 Here’s my initial design, it took a while to figure out how to give the rocking horse a treble clef shape. A. I should consider a career in making life-threatening children’s toys. Here, can you see the treble clef now? 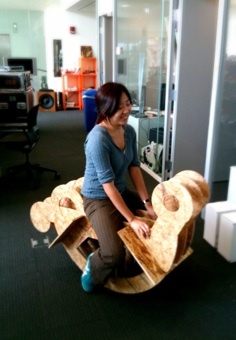 At this point, the rocking horse was pretty dangerous to sit on. 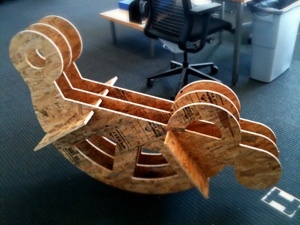 The OSB was notoriously uneven, so the press-fit joints were not as tight as I would have liked. Also, it was really uncomfortable to sit on three sheets of plywood. Much better! I’d like to think that I have personally mastered the art of sitting on this particular rocking horse, although it still catches other people unawares. This rocking horse definitely has an unstable equilibrium. I was half hoping that some hapless kid would stumble in during this week’s member meeting and get a good scare on the rocking horse. Alas, there were no crying children (or adults). 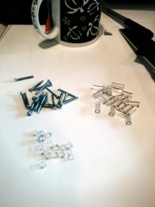 To assemble the xylophone, I enlisted the help of some felt, screws, and medical tubing. B. Making instruments is fun! 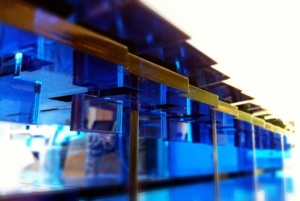 Neil had mentioned in class that someone made a glass xylophone using the water jet cutter. This pretty much blew my mind, like, I can make instruments! After talking with Laurel, who made the said glass xylophone and gong, I learned that glass is notoriously difficult to cut. But hey, aluminum is much easier, the shop has it in stock, and it sounds good. 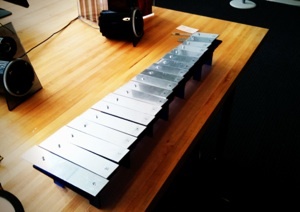 To be slightly different, I decided to build a xylophone that can play the blues scale as well as the diatonic scale. The result was a normal C major diatonic scale with a D# introduced so I could also play the blues scale in A. I based my keys on one of Laurel’s keys and figured out that for 1/8” thick aluminum keys at 1.5” width, a high C is around 4.9408”. Based on that, I calculated the rest of the key lengths according to this awesome calculator. 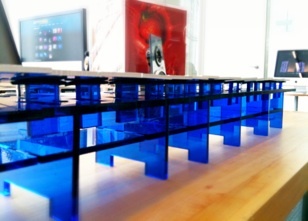 Since I had a blues scale xylophone, I wanted the base to be made of blue acrylic. 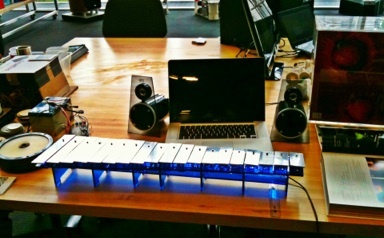 I have blues to add electronics to the xylophone, and LEDs would look pretty with the colored acrylic. 2)I don’t trust myself to design a fixed length box that would hit the nodes of all the keys. This way, I get some safety margin. I would like to thank Yoav for showing me how I could design sliding tabs in the base. 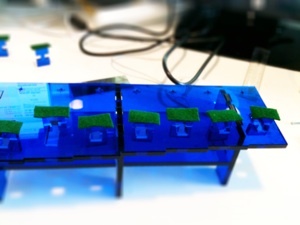 The picture on the right shows the xylophone sandwich: screw + tubing + key + longer tubing. I had the xylophone at my demo station for the Media Lab member meeting, which was a little anti-climatic because people kept on expecting it to do something, well, electronic. A potential final project idea is to “pimp the xylophone” so it can be hooked up to a laptop for automatically generated accompaniment or sound modification. And of course, there will be lights. 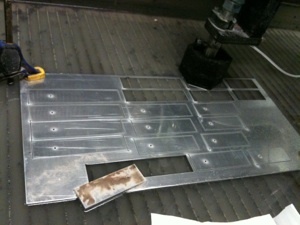 For technical notes on how to use the shop bot, water jet cutter, or xylophone design, click here.